By default, Toon Boom Harmony is set to the Basic mode. For simple productions, it is recommended to use the Basic mode. This setting stores the palettes automatically for you and saves them at the Scene level. 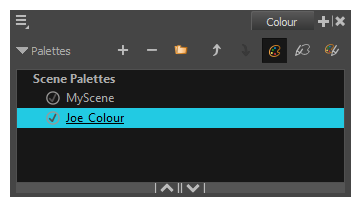 When you use the Advanced Palette Lists mode, you can decide at which level you want to store your palettes: Environment, Job, Scene, or Element.To enable Advanced Palette Lists, see Enabling the Advanced Palette Lists Mode . Set the Palette Type to Colour if you want to create a colour palette, or to Pencil Texture if you want to create a pencil texture palette—see About Pencil Line Textures.